With the Ayushman Bharat - Pradhan Mantri Jan Arogya Yojana (PMJAY) - - crossing the 100 - day mark, the government has started dispatching over nine crore personalised letters to the beneficiaries to educate them of benefits of the scheme, but the move has met with criticism from the Opposition who called it BJP's poll propaganda ahead of the general election. Indu Bhushan, CEO of the Ayushman Bharat programme told IANS that about nine crore letters have been printed and are being dispatched to beneficiaries. "The two - page letter is addressed to the beneficiaries across all the states, written in eight languages. The letters have already been dispatched since Sunday, " he said. 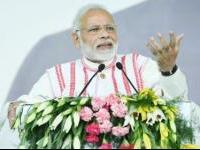 The letter that has been written by the Prime Minister Narendra Modi talks about the benefit of the Ayushman Bharat scheme along with other schemes such as the Pradhan Mantri Awas Yojana, Pradhan Mantri Ujjwala Yojana, Pradhan Mantri Jeevan Jyoti Bima Yojana among others, before ending with his note on the PMJAY. While Bhushan said that the expenditure for printing the letters is 'reasonable' and did not clarify on the exact amount being spent by the Centre, he noted that the amount has not been spent from the budget allocated for the Ayushman scheme. Launched by Modi in September last year, the scheme seeks to bring 50 crore poor people under a medical insurance cover of Rs 5 lakh per year. The states are required to chip in with 40 per cent of the funds. The Opposition slammed the BJP government for spending over Rs 400 crore just on the "letter spree" when the actual budget allocation was Rs 2, 000 crore. CPI - M parliamentarian M. B. Rajesh said the BJP government was misusing the public money for poll propaganda. "As per the information we got, the government has spent Rs 25 crore on printing these letters. If we take into account the expenses on using speed - post to dispatch them to the beneficiaries, which is Rs 410 crore, the overall expenditure comes around Rs 435 crore. It is one - fourth of the total budget outlay for the scheme, " Rajesh told IANS. He said the scheme was portrayed "as a charity by Modi like Obama - care, " ignoring the states' contribution. Accusing the Centre of neglecting West Bengal's contribution to the scheme, Chief Minister Mamata Banerjee earlier this month announced that her state will not pay its share of funds for the project and asked the Centre to pay the full amount if it wanted to run it. "Why should we contribute 40 per cent of the funds for Ayushman Bharat?